Wow. I had completely missed this news. I'll be watching the continuation of this story with great interest since I am anticipating a return to the east coast in the next year or so and had been thinking I'd be doing more track days with NESBA. Apparently it won't be NESBA... I do know there is/was a fairly strong sentiment among track day junkies when it came to NESBA - a lot of riders loved them and a lot of riders hated them. I started my track day journey with NESBA and had no issue with their system. I did hear one or two stories from riders describing what I agreed seemed a valid complaint but those stories were the exception and not the rule. I do have to wonder if negative feelings among some riders was a contributing factor to the split/downfall. This news is perhaps even more disconcerting to me when I think about last year and Track Tactics (formerly the main track day group for NOLA) going out of business. Is the motorcycle track day world dying out? Or perhaps is this just a cyclical changing of the guard so to speak? I surely hope it's not the former. My synopsis... Vanson will be made more or less specifically to your order and they do have a great reputation. Fit and finish should be excellent overall; also the suit probably will fit you much better (but might not). A better fit also means better comfort and possibly better protection since the suit won't bunch up or be loose in odd places. The AGV will work just fine; you should have no fear of owning one. But it's likely to be more the character opposite of the Vanson. It'll be a generic, made for the masses leather suit. If you can try on the AGV and you believe it fits well and will be comfortable to spend your day wearing, then going that route likely makes for money well saved. If it doesn't "fit like a glove" then I'd suggest talking to Vanson. I suggest you might also consider looking at Pilot leathers. I have the older Alpha suit (now discontinued I believe) and my next suit (if/when I get one) will be a Pilot EVO. I'm sure experiences do vary, but I've yet to meet anyone in person who had nothing but good things to say about their Pilot leathers. I crashed in mine the very first day I had them on the track - I don't recommend this - and they protected me perfectly and sustained only some minor scuffs (I was in the grass however). The EVO suit is only $1300 and they will do most graphics, names, numbers, sponsors, etc. (or nothing at all if that's your preference), on your suit at no cost and also can make minor tailoring adjustments at little or no extra cost if the off-the-rack size doesn't fit you just right. I rode my Triumph Speed Triple at a NOLA track day yesterday. I had brand new Q3's on the bike. Start of the day was chilly (45 deg F) and damp from rain the night before so we all were very cautious the first two sessions. The sun came out just before lunch and with a slightly higher temp (50-55 deg F) and a dry track we all started to ride a bit more "normal". So, I started the day at 29 psi cold pressure both front and rear; I didn't bother with tire warmers. The Q3's were fabulous the whole day; never made any adjustments. I felt firmly connected to the track the whole time. Although I was cautious early in the day, even then I never had a tire squirm or give any vague or scary sensations. Always felt as though they were sticking like glue. Once the pace finally went back up to my near normal (a middle to upper intermediate pace) I felt nothing but confidence with what the tires were doing. Honestly, I don't have my thoughts and vocabulary well put together... in short, I loved the tires and my only question will be how well they wear. I wasn't intimidated by the S1000RR (maybe I should've been) when I did my first school but I did wonder to myself why put new students on a literbike? However, I pretty quickly came to essentially the same realization (some of it was quickly/easily explained to me) as in rchase comments. The S1000RR essentially can be programmed to be more tame than a modern 600, as potent as all but the purpose built race team literbikes, or somewhere in between. It's a pretty awesome bike to be sure. The only potential downside I can see is very small and/or very weak riders might struggle with the bikes size/weight, but even a modern 600 could just as well be too much for such a rider, so in the end I expect that really has been a non-issue. In my humble opinion, you absolutely should ensure your suspension is working with you and not against you. Having your suspension serviced - meaning properly adjusted to settings which fit you, if necessary ensuring you have adequate springs, fluid etc. - is perhaps the single most important thing you could do to your bike, especially as a beginner. Look up "Dave Moss" on youtube and watch some of his videos just to get some background on how important it is to have a well-functioning, setup suspension. (You do not need to buy full Ohlins components to have a well-serviced suspension). Just because you can manage a track day with a totally stock (i.e. "factory") suspension settings does not mean it is in your best interest. By way of example, I was riding track days with a stock suspension with factory settings (had never adjusted a thing) on my Triumph. 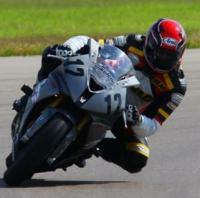 I had the privilege to work with Dave at a track day and he immediately made a whole bunch of adjustments. I never knew I was having problems until I felt the difference based on his changes. Everything felt cleaner, sharper, more confidence inspiring, etc. Again, I thought the bike was great, but it then worked so much better after simple adjustments I could hardly believe it was the same bike. That was unequivocally the best $40 I've ever spent on a motorcycle. The timeline for the day runs pretty much the same for either format. The obvious difference is the timing of when groups go on track since 2-day is just two groups versus three in the 1-day. Willow Springs Area Hotel Recommendations? Military folks also have Edwards AFB as a nearby and excellent option for lodging. Their visitor quarters were very nice and very reasonably priced. Not sure how they manage retiree and other federal employees but I'd say it'd be worth calling them to ask, if applicable. Also, and long story short, I had some medical troubles the time I did CSS at SoW and I had to convalesce at Edwards for almost a week before returning home. My wife flew out to CA and they gave us a house for our stay! Good write up on your experience with the new Q3 - thanks. I don't ride my Speed Triple much these days but I'm going to try Q3's next time I need tires.